I have long thought that providing young worshipers and the adults in their lives the opportunity to share common worship experiences leads to great depth and spiritual growth. When young and old alike explore common Scripture passages, it lays the groundwork for significant conversations. These conversations can happen in family worship, but they can also happen through thoughtful, age-level worship experiences. At the same time, I have a deep appreciation for the liturgical church calendar. It ties us to believers from a multitude of tribes and creeds down through the ages. Now that I am among the mere 10 percent of the world’s population who live in the southern hemisphere, I find the church calendar more important than ever. The connection I experience to my brothers and sisters from around the world as we journey through the church year together provides a sense of groundedness and stabilizes my equilibrium. While everyone else is hanging stockings and donning sweaters, we’re throwing open our windows and donning jandals (flip flops). While everyone else is welcoming the first signs of spring, we’re noting the multicolored signs of autumn. We can find it so easy to feel opposite and other. But we are bound together—no matter which theological stream, continent, or hemisphere we’re from—by an intentional, rhythmic journey through the church calendar. And so, while everyone else is journeying through the wilderness of Lent, we are too. Advent, Christmas, Epiphany, Ordinary Time, Lent, Easter, Pentecost, Ordinary Time. Repeat. Our youngest and oldest worshipers can find richness, meaning, and depth in the intentional rhythms of the church year and the strategic use of the Lectionary. Let’s be honest, though. The language of liturgy and the Lectionary texts of the church calendar can often be abstract and confusing. Some of my friends from other traditions confess that they have found them to be stale, rote, and somewhat meaningless. But it doesn’t have to be that way. We recognize that learning takes place through play and exploration. Significance is gained through experience. Words and rituals need explanation in order to gain meaning. 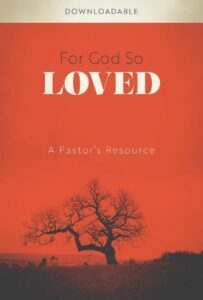 For God So Loved, The Foundry Publishing’s Lent resource for 2019, attempts to bring it all together. It’s a guide for the entire church family that provides opportunities for everyone to engage in this important season of the church year. 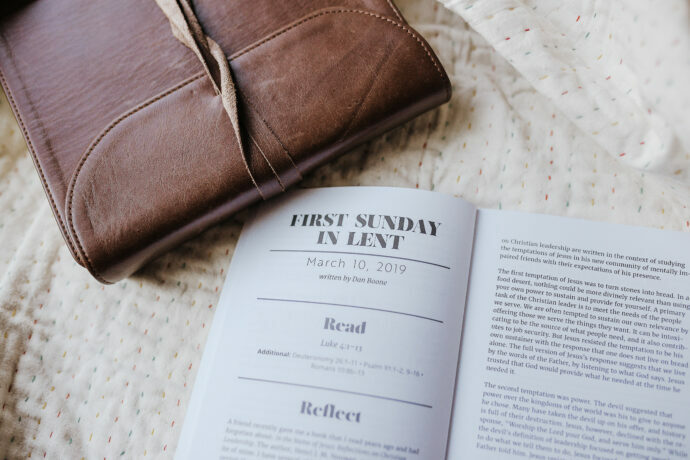 The components that are geared toward kids are based on the Lectionary’s Gospel text for each Sunday in Lent, plus Ash Wednesday, Maundy Thursday, Good Friday, and Easter Sunday. You’ll find the texts aren’t necessarily the go-to narrative stories like Jonah, or Jesus feeding the five thousand. They also don’t simply stretch out Holy Week over the course of the entire season. However, they are important words for all of our worshipers, ones that we don’t need to shy away from. The activities in For God So Loved have been developed with small churches and small budgets, as well as big churches with lots of kids to engage, in mind. They’re for churches on every end of the spectrum, from those that provide an hour of children’s church each week to those that facilitate family worship every Sunday. When young and old alike explore common Scripture passages, it lays the groundwork for significant conversations. Each Sunday, you’ll find a jumping-off point for age-level worship like children’s church, Sunday school, or mid-week activities. There are also ideas and a framework for family worship (that can be used in age-level worship as well). In addition, the take-home ideas are meant to be simple and achievable for families with full lives—ways that help nurture godly conversations but don’t require fifty dollars’ worth of craft supplies each week. You’ll also find a PDF for a printable art journal that can be used as part of age-level worship, or printed, bound, and sent home for entire church families to enjoy. One family I know used a similar art journal over Advent, with a copy for their toddler, one for their kindergartener, and one for each of the parents. They set aside time together to draw and reflect and share. In all honesty, I’ve never so looked forward to an Ash Wednesday service as I am with the For God So Loved Lenten resources. I can’t wait to experience the taste, smell, touch, sounds, and sights of Ash Wednesday with my multicultural, multigenerational church family. I’m anticipating a service that drips with “aha!” moments and deep significance that powerfully propels us into the season of Lent. Here is a sample family worship activity from For God So Loved. Each week comes with activity options to choose from that best fit your community. Today, we’re talking together about temptation. Temptation is being attracted by something that might not be good. After Jesus was baptized, he was tempted by Satan in three big ways. So Jesus knows exactly what temptation is like. You might feel tempted to eat your treat or take just a tiny nibble, but don’t give into the temptation. Instead, bring your treat to [designated adult] after the service to show that you, like Jesus, resisted temptation. After the service, the designated adult may choose to let the kids eat their treats, trade one marshmallow for two, or upgrade the treat to something a little bit bigger or more special like a cookie. • What does it feel like to be tempted? • How would it feel to be tempted by this treat if you had not had anything to eat for 40 days? • Why do you think Jesus was tempted? Fold your paper into thirds. In each section, draw a picture of one of the ways Jesus was tempted (with bread, with power and authority, and with the ability to do something spectacular). • Which temptation do you think was the most challenging for Jesus? • Which do you think would be the most challenging for you? Why? Jesus’s answers to Satan are direct quotes from the book of Deuteronomy in the Old Testament. The message is pretty much summed up in Deuteronomy 6:3. Find Deuteronomy 6:3 in a Bible. (Hint: Deuteronomy is the 5th book of the Bible—Genesis, Exodus, Leviticus, Numbers, Deuteronomy.) Ask an adult if you need help. Write down the verse on your paper or whiteboard. Decorate it and use fancy letters if you’d like. If you’re up for an additional challenge, find all of Jesus’s responses to Satan in Deuteronomy 6:13, Deuteronomy 6:16, and Deuteronomy 8:3. • Why do you think Jesus quoted scripture as his answers? • What does Deuteronomy 6:3 say to us today? For God So Loved is a Lenten resource for church families based on the Lectionary and invites communities to join Christ on his final earthly journey and rediscover the very reason we remember and undertake this same pilgrimage year after year. Beginning Ash Wednesday and ending Easter Sunday, For God So Loved provides resources for pastors and communities to move closer to Christ through worship, prayer, reading, and participation. Purchase and download this resource for only $34.99. Devotional books are available for communities at 50% off when purchased in packs of 10.